Type Transaction List with Splits in the search bar. On the other hand, adding the splits in the Transaction Detail by Account report would be a great idea. I recommend sending this idea as a product suggestion. Please click on the Gear icon and select Feedback. Let me know if you have any questions. I'm here to help you. I'm using Desktop 2018 Accountant Edition. In the Report Center I don't see the Transaction List with Splits. It doesn't come up in the search. Which section will it be in? Please help. did you ever get a response? I need the same report. Pleased to see you here in the Community. I can help pull up the report that you need in QuickBooks Desktop (QBDT). 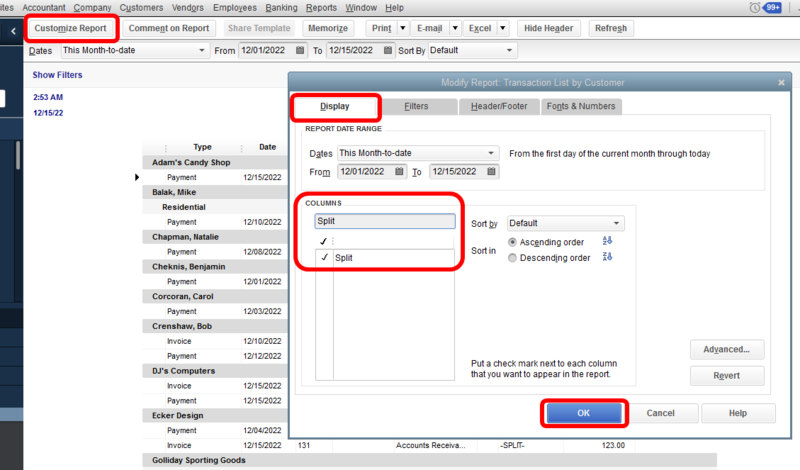 The Transaction List with Splits report that my colleague provided is only available in QuickBooks Online (QBO). But I have good news for you. QBDT has a report that can also pull up split transactions which is the Transaction List by Customer report. All you need to do is customize the report and add the Split column. 1. Go to Reports menu at the top menu. 2. On the drop-down, choose Customers & Receivables, then Transaction List by Customer. 3. Click Customize Report on the upper left. 4. On the Display tab, enter Split under Columns and put a checkmark beside the result. 5. Once done, select OK.
You may also check out these screenshots below. For future reference, you can visit this article for more information on how to customize reports in QBDT: https://community.intuit.com/articles/1764375. That should do it! Please don't hesitate to leave a comment below if you have follow up questions or if I can be of further assistance. I'm always here to help. Have a great day. I have tried your solution, however this does not solve my problem. I was hoping the actual splits would be displayed, but the description in the split column just says "-SPLIT-". I tried this solution, however it does not solve my problem. I was hoping to actual display the spits in separate line items, but the split column just displays "-SPLIT-"
It's nice to hear from you again. I just wanted to hop in and provide additional clarification about the report you're trying to create. At this time, there isn't a report that displays your transactions for a specific period, including the actual splits. You could always use the Transaction Journal. However, that would only show you the splits of one transaction. It sounds like a great report and I can see how adding it in QuickBooks would help you, and others, get a good look at the accuracy of your books. Rest assured, I'm going to submit a feature request from my side, which is sent to the Product Development Team. They're constantly looking for great ideas from users, like yourself, when deciding how to enhance QuickBooks Online. Please let me know what else I can do to help you today. Thanks for coming to the Community, wishing you continued success in all that you do. The solution you outlined again only shows the split detail once a specific split transaction is drilled into. I am looking for a GL report (on QB Premier 2018 Desk Top version) that provides the split detail within the report itself (without having to drill into individual transactions in order to obtain it (my reason for this is because I download the GL into a spreadsheet, and need the individual account activity. Any suggestions? Thanks for joining the Community today. Allow me to join this thread and provide you with some more details about pulling up split transaction reports in QuickBooks Desktop. Being able to pull up a General Ledger report that provides the split detail within the report itself is currently not an option for us. To view an individual account's activity you'll need to pull up each transaction manually. To learn more about the available reports that you can pull up in QuickBooks Desktop, please visit this article: Customize reports in QuickBooks Desktop. Also, I'd encourage checking the What's New option on your QuickBooks to be updated with the product improvements that would be beneficial for you and your business. Click on Help at the top menu bar. Feel free to reach back out to me if you have any other questions about pulling up reports or anything about QuickBooks. I'll be around to lend a helping hand. Have a nice day ahead!